There’s no two ways about it – Saiyan has been the least represented Style at every Regional event this season. Everyone is curious to see what Saiyan can bring to the table in the next set, and the poll reflected that loud and clear. Thanks to anyone who was able to vote! Throughout the design process of Dragon Ball Z: Evolution, Saiyan had its strength enhanced in numerous ways. However, special attention was given to making sure that the upgrades were reasonable, with an emphasis on providing Saiyan tools to answer the modern metagame. Equally important, the new Mastery needed to be playable in a way that did not completely invalidate the tactics of Saiyan Empowered Mastery. The Constant ability means that you’ll only need 17 anger to win the game by MPPV, but even a beatdown deck can expect to level up regularly with this effect. The difference between this static reduction of the anger threshold and simply “gain an extra anger each level” is astounding. Saiyan Rampaging Mastery is able to recover from anti-anger effects with quick bursts towards the reduced threshold, which greatly changes the flow of offense. At the same time, all of your Styled Attacks gain the ability to raise your anger with each hit. Playing more attacks means dealing more damage as you level up – to deal more damage! Note that the anger gain is optional, so you’ll never be forced to level (a common pain with the old Mastery). On top of all that, this Mastery also allows you to turn any card with Endurance into an attack from your hand. This allows you maintain a higher threat density, and you’ll always have the potential to apply pressure in any given combat. If a situational card with Endurance shows up as damage, it served its purpose. If it shows up in your hand, you have the option of activating your Mastery to make an attack. Either way, you’ll still have several key decisions to make when constructing your deck. A large amount of Endurance can create a brick wall with some flexibility during combat, but it will come at the expense of the flashier effects. A more MPPV oriented build can certainly afford a smaller Endurance package while enabling Mastery attacks, but how does that ratio look for a deck with a normal block package? There’s a lot to unravel here, and it’s up to your individual playstyle to go off book and forge a new path towards the optimal builds. Saiyan Interruption finally gives the Style a tool to catch an opponent in bad combats. In the current competitive landscape, decks have been able to cheat on block counts due to their efficient ways to control combats. While those tactics will certainly retain their value, Saiyan now has an extra weapon to punish any decks that are being a bit greedy with defense. The effect adds insult to injury by forcing your opponent to skip his next action, ensuring that the outcome is as painful as possible for anyone trying to flee. In matchups where combat ending is not relevant, it cheerfully backs up as a solid stage damage attack. That’s good, especially if a lot of Android 18 decks are present. 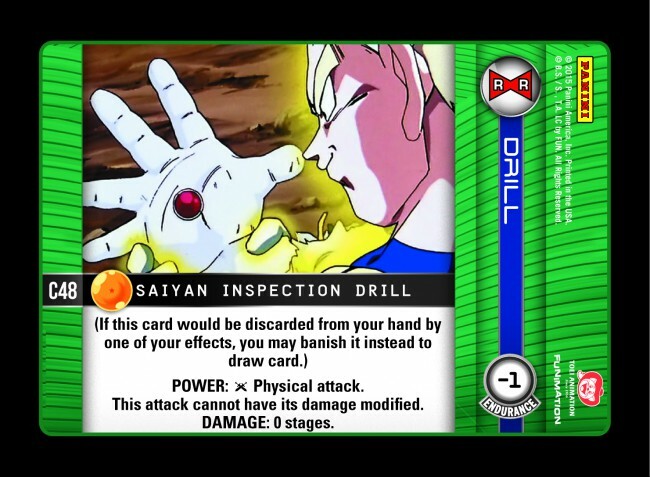 Saiyan Inspection Drill will most often be used as an Endurance pitch to your Mastery and cycle a card. However, the Drill itself has various unique uses to pierce cards like Orange Burning Aura Drill or trigger other “HIT” effects. Saiyan Sword Strike is the one many new “hard to blockables” – conditional attacks that become harder or impossible to block based on a given deck construction. 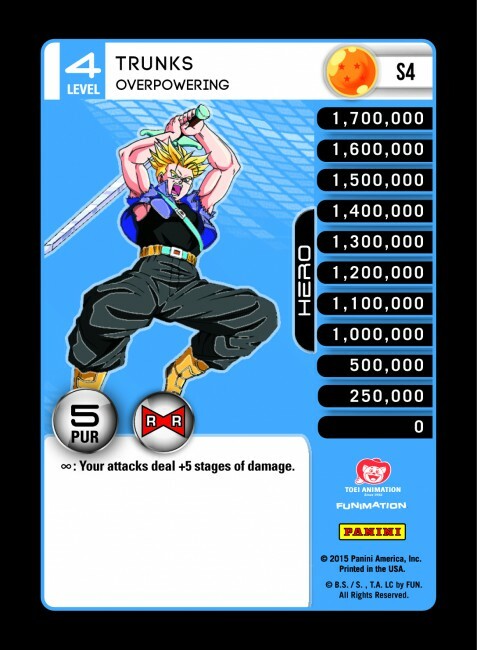 This attack in particular punishes passive decks, while generally rewarding Saiyan for keeping up the pressure. 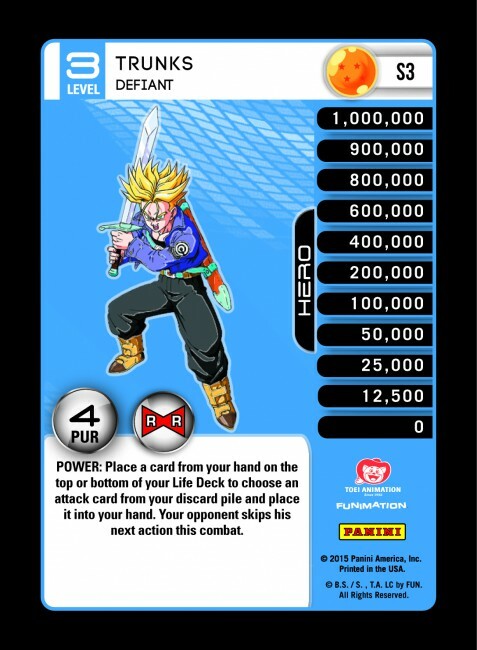 Trunks is paired with the Saiyan Starter Deck, and he brings a great deal of heat to the table. Trunks Level 1 has applications in numerous Styles. Whenever a stage modifier is present, his attack Power can generate troublesome pressure for the opponent. It’s easy to envision scenarios in which your opponent must draw two physicals blocks or be unable to perform any energy attacks for the entire turn. 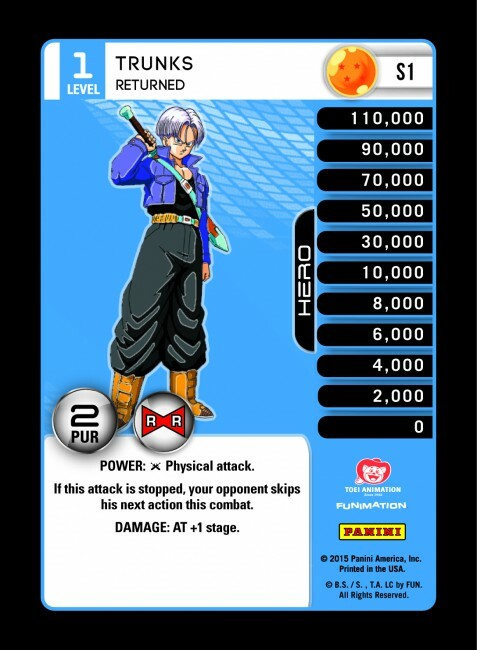 On Trunks, Swordmaster, you’ll gain access to a powerful physical attack. The differentiation in usefulness between direct stage damage and “AT +” attacks will be more important than ever in the upcoming environment, and a huge shot like this is always welcome. It can be a bit tricky to pull off with proper timing, but then again you might want to be running the old version of his Level 2 in the first place – though you could also Sword Stance from the old Level 1 into this Level 2 nicely! This effect is Visiting the Past on steroids, giving you quick access to any attack in your discard pile and creating an immediate opportunity to utilize it. This can recycle removal to cripple control, grab defensive oriented cards in certain decks, or just hit really hard. Despite this card’s obvious playability, it still requires thoughtful application. The decision to use Trunks, Defiant or Trunks, Energy charged will be one of the key starting choices of any new Trunks brew. 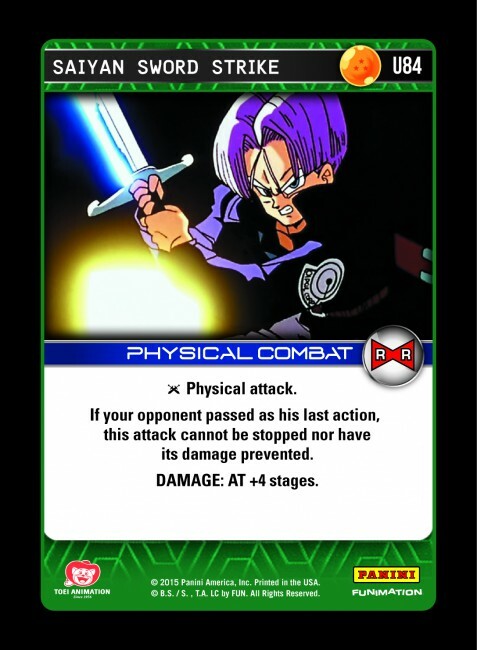 Trunks Level 4 keeps things simple, especially when the match simply ends. A massive damage modifier provides a lot of value if it utilized early into combat, so leveling up into this provides an interesting alternative to the “when entering combat” effects of his old Level 4. On a final note, you may have noticed some changes and improvements to the card templates. Setups and Drills in this set feature a horizontal presentation (makes them easy to notice as dead cards on defense! ), and the general ordering of card effects has been revamped. Now, the steps of each card are separated onto individual lines – in the exact order that each effect should take place. You’ll also notice that Endurance has been removed from the text box, and it is now represented by a logo similar to PUR (see bottom right of Saiyan Inspection Drill). 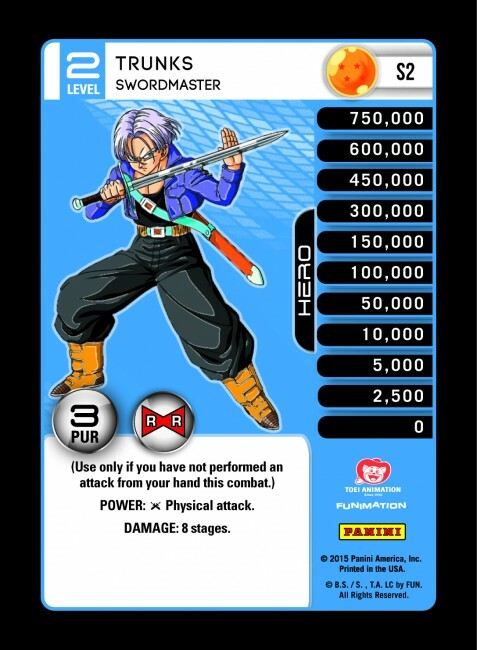 ok panini this trunks is amazing, I love it, the cards are pretty good as well but the new style is… well unpleasant to look at. And get rid of the borders on the MP’s just leave it borderless so it looks full art, it looks better that way. While I understand the reason for the template change, it is not easy on the eyes and jumbled and blocky like a test template or an amateur design of one when a tcg is in beta. Brief review of what was revealed: worst card template ever. Set 3 was beautiful but these make me not want to play. Seriously, not trying to be mean but the templage should shift back to the old style. The mastery is all i care about when it ocmes to the cards right now and i am so disappointed it isn’t funny. Another anger based mastery? Really? You should have given saiyan a new direction not just an enhanced version of what they already have. Poor first day of previews. There are two problems with Saiyan Empowered Mastery. 1) It’s better with a larger amount of Anger density in the card pool, but there aren’t many Saiyan Style cards that gain Anger on their own. 2) It’s watered down from the Buu Saga Saiyan Mastery, but with the same denial of MPPV. They lowered the amounf of Rejuvenation Anger, removed the stage gain on Rejuvenating (although the timing window was relaxed and made more frequent), and the Stage gain from attacking now has a HIT confirm. All in all, I don’t have a problem with these changes, but adding HIT confirm means it actually needed a positive adjust for risk/reward. 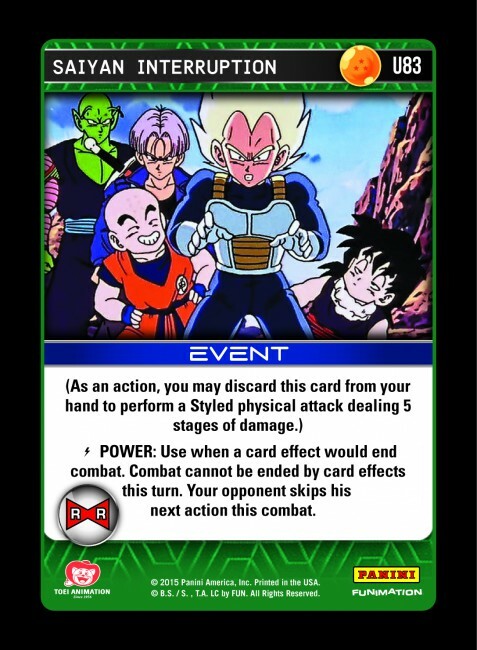 A gain of 4 or 5 Stages gained would have been better (4 is ideal if no initial Saiyan cards had an energy cost above 2. I’m looking at you Saiyan Cheap Shot). Both of those problems actually aren’t that bad, they just combine to form a picture where it’s a horrible Mastery for an initial set. Time will make it better as we get better Saiyan Anger tools and Rejuvenation sources. The Rejuvenation is what really sets it apart from the new Mastery, so pay attention there Panini! Not sure if i’m a big fan of how the new cards look (except for the MPs, I think they look good). Exciting to see though. These new templates are a bit hard on the eyes, especially when compared to the other sets. It’s also a tad confusing to the new players our group is trying to demo the game for. We showed them these new cards and they didn’t understand why things changed and why drills are now sideways. I just hope they don’t bail on us lol. Personally I would have given saiyan a hand advantage mastery (like the first 3 score masterys) but this isn’t bad. Sorry to jump on the band wagon bit this template is really awful, although I like organizing the order of the card to reflect the order of play (i like the personalities tho). I just don’t understand why every style but namekian is so stingy with hand advantage. I was hoping for something to differentiate the style from red more. I think Sayian style should focus on pur and the mastery allows you to advance a level if you would power up over your max power and you cannot win by MPV. This would help focus on physical attacks being a priority due to the sayians naturally higher powerlevel anyway. Just my 2 cents, I am not a huge meta gamer so I might be way off base with my idea. Either way I am excited as I think Panini has done a wonderful job bringing this fun game back to life. I’m not normally one to criticize, but I’m really not a fan of this ‘evolution’ of the card template. Old Z had similar changes and I felt the same way about those (Buu saga cards were hideous). For me, these lose the identity of the game, which is maybe what you were going for (a step further away from Old Z, which is fine), but that uniformity and “old familiar” is what made this run so accessible. Card orientation is another difficult change for players. I’m sure it isn’t an issue for everyone, but to have some drills horizontal and others vertical is going to be maddening. Maybe to the point of not wanting to use those cards. It’s probably too late to go back to the Movies template, and you may not want to even if you could, but the previous posters and I all seem to be in the same camp on the topic. This mastery really, really needs its second feature to be a styled attack. If it is styled there is actual value in discarding cards, gaining an extra anger in turn while doing a small amount of damage when in a bad situation is somewhat useful. 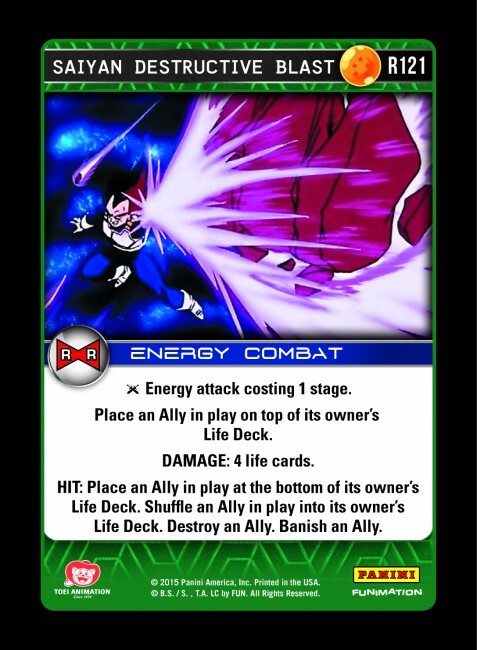 There is legitimately one good card to pitch in Saiyan and its Saiyan Scouting, every single other card is either so situational deck building around it is worthless, or its own effect is much much better then pitching, especially considuring almost all endurance cards a Physical Attacks. Of the three blocks available to mastery pitch one is an energy block that gains anger *Never going to be pitched* and one is a Phys Block that gains anger (Same thing) and one is Hand Swipe, that is 4 stages if pitched or 1-3 stages if not pitched and +3 life cards of damage for the next attack. Seriously Panini, Erata that non-styled off that mastery. Your killing us here. P.S Templates look great, but you might wanna do some re-releases of the old Drills so everything looks nice and uniform, I feel people care more about everything looking the same then they do about the change in the first place. Just comeon, do you really want Saiyan to not be played for another year. The template doesn’t bother me in the slightest. It’s not the worst I’ve ever seen. However, this new mastery? What is it supposed to do? It’s strictly worse than empowered mastery. You can fill any other style deck with cards that inherently gain an anger or two. If you play red, you can potentially have crit turns that turn one/two anger cards into two/three anger cards. Black and Orange both have anger gain that puts the current empowered mastery to shame. 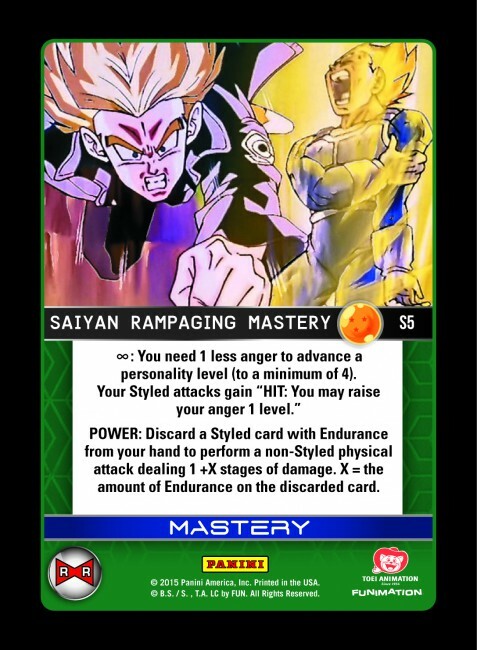 With roughly 6 saiyan cards spoiled, none of which immediately raise your anger, the usefulness of rampaging mastery is much lower than empowered. Any card printed with immediate anger gain will be better in empowered by gaining two anger every attack. You’re actually leveling, not only at “unprecedented speed” as stated by Panini, at comparable rates to Red, Black and Namekian. Incredibly disappointing mastery, ten steps backwards from where the mastery should have gone.